The non-rotating Tiffen 125mm Coarse Thread 85 Linear Polarizer Filter combines both an 85 color conversion filter with a linear polarizing filter to blend the effects of both filter types into a single, convenient solution. 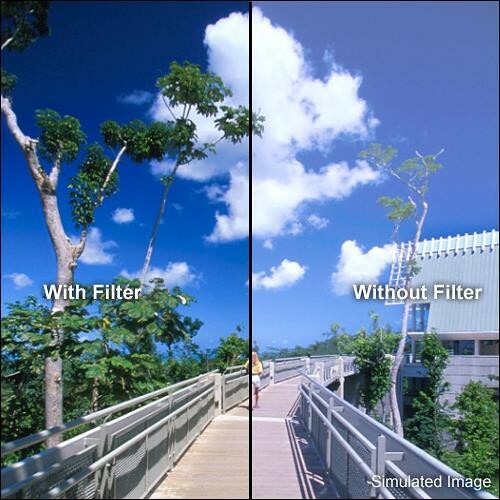 There is a total filter factor of about 6x, requiring an increase of 2.6 stops for normal exposure. Tiffen filters are made using ColorCore technology, a process that involves laminating the filter substrate between 2 pieces of optical glass, grinding flat to a tolerance of 1/10,000th of an inch, and then mounting to precision metal rings. The non-rotating design of this filter is best-suited for use with lens hoods, adapters, or other rings for rotational control over the polarizing substrate. Non-rotating design is best-suited to use with lens hoods or adapter rings in order to best control the polarizing effect of the filter.